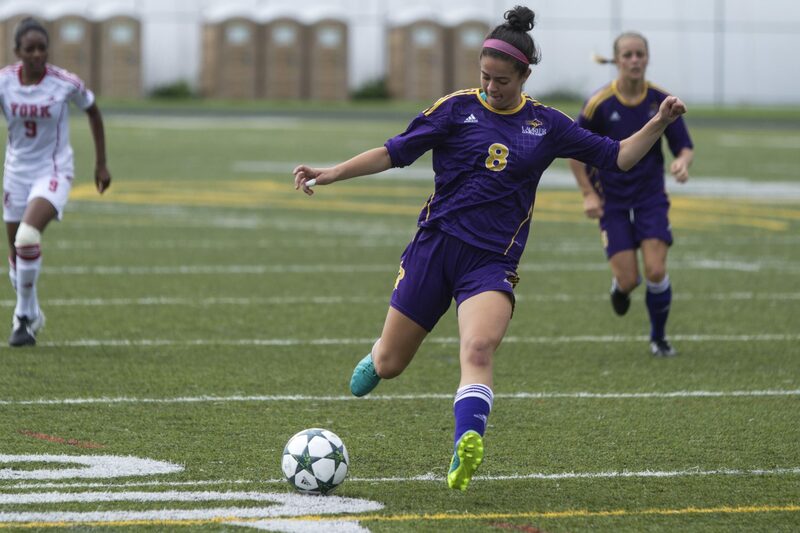 This past Sunday afternoon, the Laurier Golden Hawks women’s soccer team played host to the York University Lions. The Golden Hawks started the game well defensively, not giving the Lions many looks in their own end and the Golden Hawks had some nice counter attacks up the field. At the 30th minute, the Golden Hawks conceded a free kick from about 25-yards, but Ashley Almeida made a nice jumping save to keep the game scoreless. The Lions kept applying pressure, hemming the Golden Hawks into their own end, giving themselves two quick corner kicks which they were once again unable to convert on. Seconds before time expired for the first half, the Golden Hawks rushed down the pitch and Mackenzie D’Andrade rung a hard shot off the post. This battle of defence finished the first half 0-0. The second half began with some back and forth actions from both sides before the Golden Hawks were able to setup in the offensive zone and make some beautiful passing plays. The Golden Hawks were unable to muster a shot as the ball jumped out of bounds and York took back possession heading towards Laurier’s side of the pitch. At the 52nd minute, the Golden Hawks worked for a corner kick that was turned aside by York goalkeeper Taylor Grant, but not before taking a hard kick to chest. After chances from both sides, the Lions started to take control of the game at around the 65th minute, peppering Laurier goalkeeper Ashley Almeida with shot after shot that she routinely turned aside. At the 80th minute, the York lions converted on a nice passing play as they were finally able sneak one by the right side of Almeida, giving the Lions a 1-0 lead late. The York Lions continued applying pressure late, not giving the Golden Hawks much to work with as they searched for the equalizer. After a few late rushes up the field, the Golden Hawks came up short and couldn’t find the equalizer in this one, losing 1-0. Head coach ,Barry MacLean, acknowledged the defeat, but wasn’t overly critical of his team’s performance and the way that they played. “I wasn’t unhappy with our performance, I thought we could’ve had a little more urgency in the game, but overall it’s a very tactical game when you play York and they’re a very good team and unfortunately they’re the one’s that got the goal,” MacLean said. The York University Lions are no easy task as they are 8-0-3 and first place in the Western conference of the OUA standings. MacLean commented on what it’s like to host the York Lions. The Golden Hawks will look to get back on track when they visit the Guelph Gryphons on October 5.